Happy young Caucasian woman in vintage sunglasses talking on the phone, hair blowing in the wind at Brooklyn Bridge 4K. Back view of girl with hair blowing in the wind standing at river embankment, arms open near Brooklyn Bridge New York. Beautiful European girl sitting on river embankment fence, looking back at camera smiling near Brooklyn Bridge, NYC 4K. 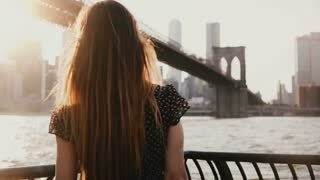 Back view of beautiful girl with flying hair leaning on river embankment fence at Brooklyn Bridge, looking at camera 4K. Happy European businesswoman in retro sunglasses talks on the phone, wind blowing in long hair at Brooklyn Bridge 4K. Successful happy businessman stands near Brooklyn Bridge embankment fence panorama in New York City, back view 4K. Back view woman with dark hair blowing in the wind riding a bicycle along a beautiful bike lane at Brooklyn Bridge, NYC.